Since I'll be rewatching and writing an article for all the Disney movies, would you like a specific day for each type (original, sequels, live action) or weekly? Which movie do you prefer from these three? Are there any Disney movies that were released the year you were born? Which Disney heroine am I? Sorry it’s just idk ?? Hi guys, I watched Ralph Breaks the Internet today after watching Traci Hines and her friends' rendition of Owl City's When Will I See You Again, the theme song for the first film and I was really blown away by the film and this sequel. Hi guys, I managed to watch the Nutcracker and the 4 Realms today and I was blown away by the movie overall. So here is my review on it! a comment was made to the poll: Since I'll be rewatching and writing an article for all the Disney movies, would you like a specific day for each type (original, sequels, live action) or weekly? a poll was added: Since I'll be rewatching and writing an article for all the Disney movies, would you like a specific day for each type (original, sequels, live action) or weekly? a comment was made to the poll: Which of these birds do you like more? a comment was made to the pop quiz question: Which Disney character do you hear speaking in this clip? 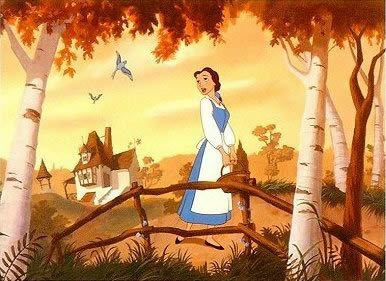 Belle is seen as "odd" by the other townsfolk because of her love for ?